AshleyNewell.me: Put on Your Sunglasses! I hope you are all having a great day! I'm running on empty today as Parker decided 6am would be a fun time to wake up. Then my kids both decided that napping wasn't going to happen this afternoon. Oy! So, here's a no stamping card I threw together the other day when we were headed to the birthday party. I can't decide if I like it or not. This is paper and chipboard I got at Target. I thought the little animals were cute and my kids have roughly a MILLION friends so I'm always in need of birthday cards. I used Mercy's current sketch for this. Alright, obviously, my mojo has crashed and burned and I have deadlines coming out my ears so I'll end this now. Hope you all have a great weekend! OOOHHH, and check out my friend Paulina's blog candy HERE! 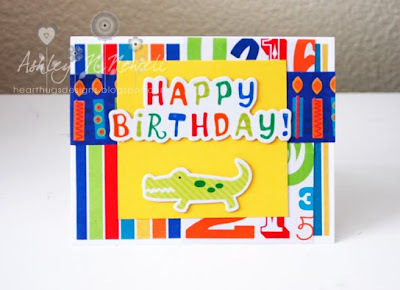 Love the alligator on your cute card! Love this bright and cheery card. Great for a kids bday. my little one has been up at 6-7am that last few days too! plus they both stopped napping 6months ago!!!! ackkk!!! Love it Ashley.. so cheerful and loving the bright colours.. a perfect kids card!! I am loving your card Ashley! So colorful and fun...perfect for a kid's birthday. OMG this is adorable! I LOVE bright colors! I'm addicted! Super cute! My "kids" (the four legged ones) love to get me up at 6am on the weekend... errrrr. I know, different than the human kind, but still. GEEZ.